The opening of Stage 1 of Echuca Regional Health's redevelopment was a major milestone in the hospital’s 130-year history of delivering care to communities along the Murray River. The public hospital has been providing health services to the Murray region since 1882 when the first patient was admitted; however in recent years the facilities had become dated and inadequate for the current needs. In 2010 1,600 people rallied in the hospital grounds to highlight the desperate need for a new public hospital. This led to State and Federal Government funding of $65.6 million to redevelop and expand the hospital. 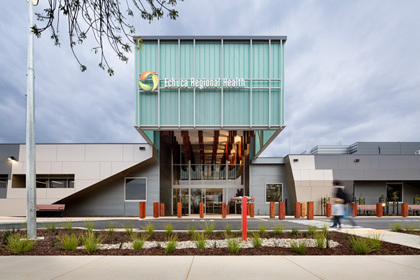 Echuca Regional Health Executive Project Manager Mark Hooper said the redevelopment involved rebuilding the acute care services and emergency department as well as the front entrance, pharmacy and health information services. "The project allowed us to improve patient comfort, increase the building's energy efficiencies and lift the hospital's capacity by 66%, with bed numbers rising from 68 to 113," he said. Construction for Stage 1 began in 2013 and was completed in June 2014. Patient rooms now include an en-suite, computer and electronic call system for improved communication within the hospital. Mark said the HVAC system had been designed to create greater patient comfort by allowing them to control the environment in their room. Brett Seeney, an Associate with WSP Consultants, Melbourne, worked closely with Mark to design the HVAC system. The innovative design earned WSP AIRAH's Award for 'Excellence in Innovation', 2014. "We wanted to create a 100% fresh air system with maximum energy efficiency. To help achieve this Brett's HVAC system design started with Rickard electronic Variable Air Volume (VAV) diffusers and the air conditioning system and energy recovery units built around them. The VAV diffusers help create a well ventilated indoor environment that maintains a consistent and comfortable temperature," Mark said. "Stage 1 of the project has 280 Rickard VAV diffusers connected to variable speed AHUs supplying air via insulated solid ducting. There is no flexible duct and the system uses static regain duct-work which ensures a constant amount of pressure to each diffuser. The diffuser aperture opens and closes depending on the volume of hot or cold air required in the room and the resulting change in pressure in the ductwork signals the air conditioning system to speed up or slow down as required." Each room has a VAV diffuser supply and return, with two supplies fitted in the larger rooms. "We were mindful that patients need to rest while in hospital and as a result the system pressure was reduced from 50Pa to 35Pa to remove all noise from the diffusers," he said. Mark said further energy efficiencies were gained by having triple glazed windows in the bedrooms and a rooftop solar field to provide energy for the chilled water system. The overall result is designed to achieve one of the lowest energy footprints per square metre of any hospital in Victoria.